'CASA da ENCOSTA' is situated in the small quiet village of PENEDO with views to the Atlantic coast and the Sintra mountains. The cottage has a large comfortable living room with table and chairs,sofa,two armchairs and fireplace with woodburner. There are two double bedrooms, one with a double bed and is en-suite, the other has twin beds. A separate shower room & toilet is close by. There is also a mezzanine platform with double mattress. Stairs lead down to the kitchen/diner which is fully equipped and has a breakfast bar and table and chairs to seat six. Double doors lead out to the footpath at the side of the cottage. The garden,which has an abundance of flowers and trees,also has a garden house with a washing machine and utility room. There are three patio areas with garden furniture,pot plants and flowers.Ideal for sitting out,relaxing and enjoying the wonderful sunsets. One of the main features of the cottage are the original hand painted Azulejo tiles. AREA: SINTRA is well known for its historic buildings, palaces and beautiful gardens. The Pena Palace is situated on top of the Sintra mountain next to the Moorish Castle. It can be reached by car, bus, horse drawn carriage or on foot! It is a very steep climb and only the very fit should attempt to walk! The town itself is a very popular tourist area and has many places of interest and a tourist office. buildings, night-life and a casino. Further north the Mafra palace and the fishing port of Ericeira are worth a visit. Between Guincho and Adraga beaches lies the most westerly point of Europe- Caba da Roca. A monument by the lighthouse marks the point. ATLANTIC COAST: The Atlantic coast provides wonderful surfing and boarding. Some of the Portuguese championships are held along these beaches. Several are easily accessible and have very good facilities including cafe/bars and excellent seafood restaurants. The beaches at Praia Grande and Praia Macas have swimming pools open to the public. The beautiful hilltop village of Penedo is set high up in the Sintra Mountains over looking the Atlantic Coastline. From the village square you can take in the beautiful views to the Pena Palace, Moorish Castle & Mayra Palace. The dramatic Atlantic coastline stretches out with views as far as Eiriceira. The water from the Sintra Mountains gushes from the village fountain (font) - the water is fresh, clean and drinkable, people come from miles around to collect it. The village Cafe is open daily (closed Sunday) and serves a good selection of coffee/tea, pastries, beers, wines & spirits, and is a real local meeting point. Casa Da Encosta is set in the beautiful hilltop village of Penedo - ideal spot for mountain walks. Ideally you will need a hire car to get around, to explore the beautiful coastline, mountains & beautiful monuments of Sintra. There is a good regular bus service which runs between Sintra and Cascais - the nearest bus stop is in the village of Almocageme - a 10 minute walk from the house. A local Taxi driver is available in the village. We spent a lovely week in Penedo at Ian's cottage. We found lots to do despite some cloudy and very humid weather. The house is really unique and cosy and extremely well equipped and Penedo is a beautiful village in a fantastic location. Definitely recommend the restaurant at Praia Adraga and a trip to the local wine collective in Colares. We had a bit of trouble with the hot water but Ian was really helpful and quick to arrange for someone to come and have a look. Very responsive and friendly host. Great holiday location. House,patios and garden all you need for a restful stay. The local Restaurant and cafe/bar are just what you want. You do need to rent a car.Collect when you arrive at Airport. English spoken by most Portuguese. We are the owners.It was a very enjoyable visit. We had a fantastic family time with our 3 kids. Everybody in the family loved it. 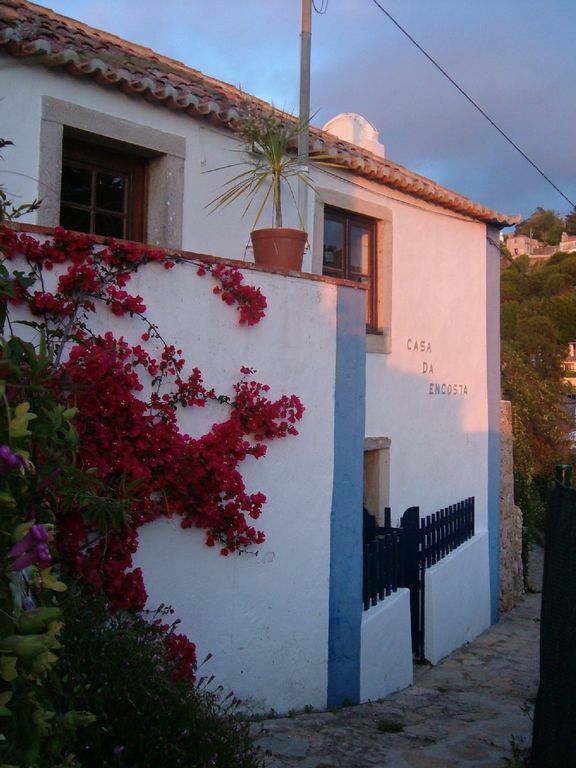 The house is just perfect, cosy, warm with lovely terraces, plants and flowers and very well decorated. You just feel you are at the end of the world, even with a rainy weather, and at the same time well integrated within the village. So quiet and charming. Real Portugal. I highly recommend it for any season. We had a wonderful holiday in the Casa da Encosta in Colares. A beautiful house, fully equiped, lovingly decorated and furnished. The flowers, the terraces, the views on the valley, the friendly help from the village people: we hope to come back here someday! Robert's cottage is gorgeous. The village is very sweet and well located (you'll need a car) for the many sights of Sintra. Highly recommended - we loved it. PENEDO is in a UNESCO Conservation Area, two miles from the Atlantic Coast and six miles from the ancient town of Sintra. The cosmopolitan towns of Cascais and Estoril are a short drive away, offering good seafood restaurants, shopping and beaches. Lisbon, Portugals capital city, is only a 30 minute drive, and easily accessible by train from Sintra or Cascais. The larger villages of 'Colares' and 'Almocageme' are within walking distance and have restaurants,shops,bars,cafes chemists,banks etc. The village itself has a small shop with an extensive range of groceries ,vegetables,beer and wine and an excellent cafe/bar(owned by 'Paulo'- he speaks some English! ), church, bandstand and village square. There is a Restaurant in the village, located next to the cafe and provides excellent typical Portuguese food at very low prices. ( 3 courses 5-8 euros including wine) Open lunchtimes 12 - 3.00, closed Sundays. Rates for Bank Holidays and Half Term may differ. Off-peak arrival/departure dates may be variable. A non-returnable deposit of £200 per week is required to confirm the booking. The balance to be paid and cleared at least four weeks before occupation. A Security Deposit (cash) is required on certain occasions. This must be paid to the Housekeeper on arrival and will be refunded if no damage.